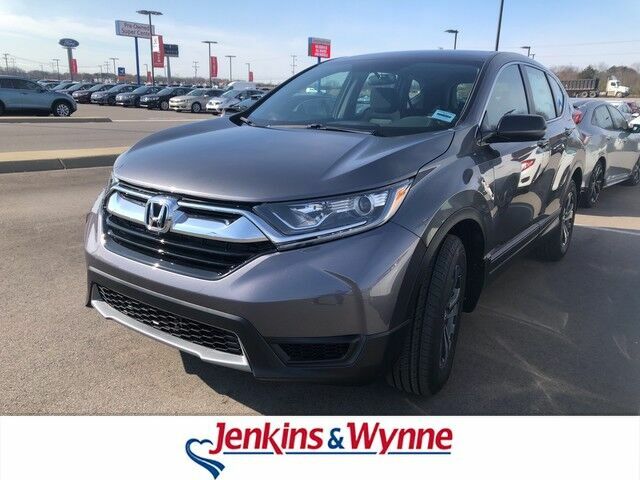 Contact Jenkins & Wynne today for information on dozens of vehicles like this 2019 Honda CR-V LX. This Honda includes: BLACK, CLOTH SEAT TRIM Vinyl Seats Cloth Seats Leather Seats Premium Synthetic Seats MODERN STEEL METALLIC *Note - For third party subscriptions or services, please contact the dealer for more information. * Want more room? Want more style? This Honda CR-V is the vehicle for you. Save money at the pump with this fuel-sipping Honda CR-V. This AWD-equipped vehicle will handle beautifully on any terrain and in any weather condition your may find yourself in. The benefits of driving an all wheel drive vehicle, such as this Honda CR-V LX, include superior acceleration, improved steering, and increased traction and stability. Added comfort with contemporary style is the leather interior to heighten the quality and craftsmanship for the Honda CR-V Although every reasonable effort has been made to ensure the accuracy of the information contained on this window sticker, absolute accuracy cannot be guaranteed. Vehicle information is based off standard equipment and may vary from vehicle to vehicle. The prices are subject to change. Price does not include applicable tax, title, license, and doc fee.